In Black Mirror Season 1, the third episode centers around a contact lens that allows us to constantly capture video of everything we see -- enabling us to, among other things, retrieve any memory on demand. Needless to say if you've ever seen Black Mirror, things get bleak, fast. A tiny augmented-reality wearable like this is still a long ways away from becoming reality (although, Google does have a patent for something scarily similar). In the meantime, a brand-new free app just launched that does essentially the same thing on your computer and phone. It's called Recall, and it records every single web page, email, text, picture, document, song, video, tweet, chat, Facebook post, or other piece of content you look at on your screen. The goal? To make searching for and retrieving information as natural and effortless as possible. Recall is the first big product from the company Atlas Informatics, which was founded by Napster co-founder Jordan Ritter. The app takes a screenshot of everything you view on your device and indexes its contents, which you can search through later -- a feat made possible by the same accessibility functions that enable your computer to read text on the screen out loud. 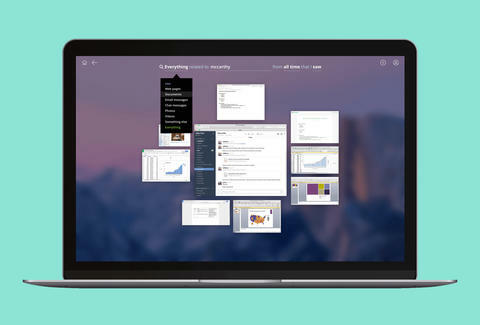 Recall then delivers your results in an amoeba-like cloud of screenshots, with the most relevant items appearing larger and more central than the rest. The way the app retrieves information is meant to mimic how the human brain remembers things. You can perform a search that's incredibly broad ("find everything I've ever seen related to X") or super specific ("find all the Excel files related to X from Monday"). You know how sometimes the only thing you can remember about something is the song you were listening to when you saw it? Recall's equipped to handle those contextual queries, too -- just look up the album or track, and it'll cull whatever you were looking at while it played. As useful a tool as Recall could be, your initial reaction might understandably be one of terror. It's a little unsettling to know every last, uh, private thing you're doing on your computer is being indexed, and could easily be found. For that reason, the company has implemented a number of measures to help protect your privacy. For one, every piece of data that's indexed is encrypted (both when it's stashed away and retrieved), and you can easily delete any and all record of what you've been up to. There's even a handy feature that will pause the app from doing its thing for as long as you'd like. The app is currently available in public beta and available for download on iOS and Mac OS. Eventually, it will be also be compatible with Windows and Android and deployable across any device you interact with during your day. Hopefully, though, it never makes it to a contact lens. Joe McGauley is a senior writer for Thrillist who could watch the "San Junipero" episode of Black Mirror over and over and over again.